As cool as it may be, when I see someone wearing virtual reality headgear and making wacky movements, I find it pretty comical. But anyone who understands the range of impressive technologies required for a comprehensive VR experience, would know that it is no laughing matter. Many sophisticated technologies have entered the exciting world of VR, and HDBaseT is no exception. So what do HDBaseT and VR have to do with each other? A cable, of course. And where you have wired connectivity, you have HDBaseT. For your VR experience to feel, sound, look and respond realistically, you need a superior infrastructure. Such infrastructures are comprised of numerous bulky cables that are each strong and reliable enough to transmit audio, visual, power, controls, USB and power seamlessly. Not only is this a large amount of cables to connect to a headset, but to achieve optimal performance levels, you need minimal transmission distance; in other words, having to stand way too close to the source. Well, at HDBaseT we know a thing or two about getting rid of cable clutter, guaranteeing minimal latency, and delivering best possible performance per infrastructure. So it was only natural for us to enter the stimulating world of virtual reality. Not only has it revolutionized the way we experience an artificial world (whether real or imaginary), but it is finding its way into many segments beyond the gaming world. HDBaseT allows the consolidation of several cables into one thin cable for VR applications, making the headgear much more comfortable, and simplifying setup. In addition, HDBaseT allows for much longer distances than possible today with regular HDMI and USB cables, enabling players to setup their VR computers out of the way, without interfering with the overall experience. Last, but just as important, HDBaseT supports the highest resolutions possible, without adding any compression or latency, guaranteeing that the virtual reality feel as real as possible! 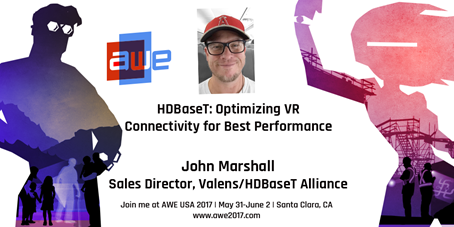 We are excited to bring our award winning technology to AWE 2017 in Santa Clara, California, where our team will present and demo our HDBaseT technology for VR applications, over a thin, 3mm cable.